Teach Your Bichon Frise 100 English Words. Obedience training, housebreaking, potty training, and crate training for Bichon Frise puppies. Dog training tips for Bichons Frises. Is a Bichon Frise easy to train? Moderate, I would say. Many Bichons do have a stubborn streak, but aren't usually dominant dogs who want to be the boss. As long as you're calm with a Bichon Frise, gentle with your corrections yet absolutely consistent and persistent, always following through on what you tell them to do, they respond well to training. Except for housebreaking. In my experience, this is the number one training issue with Bichons. When an owner drops his Bichon Frise off at the animal shelter, it's often because of difficulties with housebreaking. The only consistent behavior problem is barking when left alone too much. So when you ask, "How easy is it – training a Bichon Frise?" my answer is, "Housetraining is usually difficult. Other than that, training is pretty easy as long as you provide lots of companionship throughout the day. It also depends on the temperament and personality of the individual dog, plus your own dog training skills." That's where I come in. 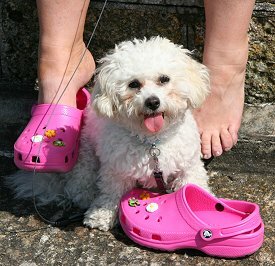 My dog training articles will help you train your Bichon Frise to be well-mannered and well-behaved. I've been working with dogs for 35+ years, as a dog trainer, canine psychologist, breed advisor, and author of 15 books about dogs. Start housebreaking right away. But expect it to take many months before your Bichon Frise's miniaturized internal organs are strong enough for reliable control. Until potty training is complete, your Bichon must not be loosed in the house. It is so easy for him to sneak behind a chair or under a small table, and it takes only a few seconds for the deed to be done. The results can be hard to see and when you don't see it, you don't correct it – and so the bad habit becomes established. If you live in a cold or rainy climate, housebreaking will be especially difficult, because Bichons hate both the cold and the rain. A COVERED potty area is strongly recommended. Sometimes a doggy door is necessary so your Bichon Frise can run outside the moment he feels the urge. Read more about housebreaking a Bichon Frise. Start training your Bichon Frise puppy the moment you bring him home. But you need to teach the right things in the right ways. Read more about training Bichon Frise puppies. Teach your Bichon Frise how to stay alone. That sounds odd, I know. But many Bichons are overly dependent on constant companionship and will bark or chew things up when they're lonely. You definitely don't want to leave a Bichon Frise alone too much (more than four hours a day is too much for this breed). But you DO want to leave him alone sometimes so that he learns how to deal with it without developing a behavioral issue called "separation anxiety." Teach your Bichon Frise to respect you. Respect Training is the key to training your Bichon Frise to be well-behaved. Teach the right words to your Bichon Frise. My method of training Bichons includes teaching specific words in specific ways so that your dog not only learns the words but also develops the respectful attitude that makes him happy to obey you. You will need to work especially hard on "Quiet" because Bichons can be barkers. "Enough" is another important word because Bichons often demand too much attention. Your dog needs to learn how to be independent, to stand on his own four feet and find things to do on his own. Teaching healthy independence to your dog is covered in my training book. Socialize your Bichon Frise with strangers and other dogs. This is usually not difficult because many Bichons like everyone and are excellent with other pets. However, some Bichons are standoffish, and if you don't teach them early on to be friendly and trusting toward people they don't know, their natural caution can become skittishness or suspiciousness, which are no fun to live with. Read more about why your dog acts the way he does toward strangers and other animals.